Network management is a hard task. G-NETADMIN – A network Management System (NMS) is a set of software and hardware tools for the monitoring and management of networks. Technological development in the mobile communication area has been growing substantially in recent years. Currently, two technologies have appeared as big players in the wireless arena. One is the result of the development and migration of LAN technologies, standardized by the IEEE as 802.11 or wireless fidelity (Wi-Fi). The other is General Packet Radio System. This paper, the G-NETADMIN, envisages to remotely control and monitor the network terminals that are connected through a LAN while the administrator is far away from the network. This also increases the scope of the administrator, by accessing the network from his mobile phone and also helps him to control the network using the same. The system offers access to the server and thereby to the client details by using three layers of security. 1) The first layer is to validate the admin with the unique username and password. 2) The second layer is to verify the cell phone number of the administrator. 3) The third layer involves sending random key to the admin to perform a predefined function so as to verify the admin. All system should have client program running. The server should identify all clients by their respective static addresses. Input: Username and password and mobile number. Output: Authenticated entry to the system. To carry out any of the function of the G-NETADMIN, the administrator is required to send a message to the server using a predefined cell phone message format. Upon receipt of a key i.e. from the server system the administrator needs to apply a predefined function on the key and send the processed key back to the server using the keyword “req”. Message Format: req <space> (processed key). This utility gives information of all the clients that are connected to the server. Moreover it provides real time reporting. Stimulus/response sequences: Reporting and alerting. Input: SMS request to the server to get the net view. Output: Usernames and IP addresses of all the clients that are currently connected to the server To get the net view from the server use the keyword “ip”. The administrator can send messages to clients. He/she can either broadcast the message to all the clients or he/she can unicast the message to a particular client. This utility actually Broadcast the message that administrator would like to convey to all the clients that are connected to the system . Stimulus/response sequences :Reporting All system should have client program running. The server should identify all clients by their respective static addresses. Output: Message unicasted to the specified clients system To unicast a message to a specific client connected to the system use the keywords “msg” along with the client name and the message in the following message format. In G-NETADMIN, the server is connected with a SIM-300 GSM Module  which receives the messages sent by the administrator and forwards these messages to the server and also forwards the server’s replies back to the administrator’s registered mobile number. Designed for global market, SIM300 is a Tri-band GSM/GPRS engine that works on frequencies EGSM 900 MHz, DCS 1800 MHz and PCS1900 MHz. 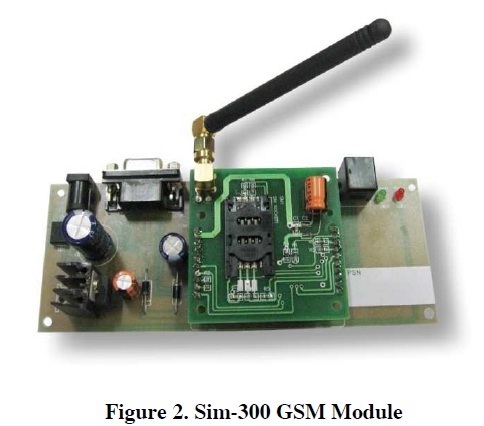 SIM300 provides GPRS multi-slot class. 10 capability and support the GPRS coding schemes CS-1, CS- 2, CS-3 and CS-4. With a tiny configuration of 40mm x 33mm x 2.85 mm , SIM300 can fit almost all the space requirement in your application, such as Smart phone, PDA phone and other mobile device. The SIM300 is designed with power saving technique. commands are instructions used to control a modem. AT is the abbreviation of Attention . Every command line starts with "AT" or "at". That's why modem commands are called AT commands. You can check and send SMS using AT commands. You can connect to your serial port via "putty" or "hyperterminal" to run these AT commands. Many of the commands that are used to control wired dialup modems, such as ATD (Dial), ATA (Answer), ATH (Hook control) and ATO (Return to online data state), are also supported by GSM/GPRS modems and mobile phones. Besides this common AT command set, GSM/GPRS modems and mobile phones support an AT command set that is specific to the GSM technology, which includes SMS-related commands like AT+CMGS (Send SMS message), AT+CMSS (Send SMS message from storage), AT+CMGL (List SMS messages) and AT+CMGR (Read SMS messages). To list a single message, you have to use the read command . You must use the list command first, so you know the indexes of the messages in the storage. For instance, to read the message on memory location '2' use: AT+CMGR=2 The modem will list the single message: +CMGR:"REC READ","+31625044454",,"07/07/05,09:56:03+08" Test message 2 OK Please note that the status of the message is now "REC_READ" instead of "REC_UNREAD" because we read the message. Once you have read a message, you can free the memory by deleting the message from the storage . For instance, to delete the message on memory location '2' use: AT+CMGD=2 The modem will delete the single message. The server and clients communicate with each other via sockets. Sockets are interfaces that can "plug into" each other over a network. Once so "plugged in", the programs so connected communicate. 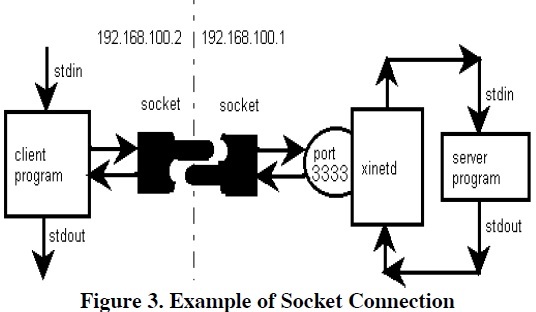 A "server" program is exposed via a socket connected to a certain port number. A "client" program can then connect its own socket to the server's socket, at which time the client program's writes to the socket are read as stdin to the server program, and stdout from the server program are read from the client's socket reads. The aim of this thesis was to explore the area of GSM networks and its SMS utility for implementation of a network management system. Beginning with the network administration, the daily tasks of the network administrators has been studied and important tasks are listed out. 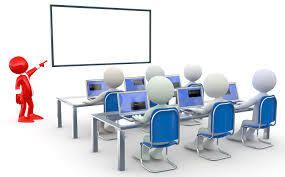 These activities can be performed even when the administrator is not around the office and even when the administrator doesn’t have internet connection or a smart phone using a simple SMS service of the mobile phone. Apart from theoretical background, this work provides ways to design and implement a LAN Network Administration System using GSM Network. Proposed system will be able to register the administrator, which once registered can access the system utilities like net view, process management, remote handling and message sending through SMS service available in his/her mobile phone that provided by the GSM network system. Major strengths of the system are scalability and reliability. It can handle any number of clients. It doesn’t require extra memory in the administrors mobile phone to handle more number of clients. Also the GSM network is more reliable than any other wireless networks. In the future work, we would like to focus on adding more utilities in our system. Also, we would like to develop a mobile application that can ease the usage of the system by providing a detailed GUI. Vieira Junior and Anido, “The Architecture of a Novel Tool for Network Management Using GSM/GPRS Mobile Devices”, Consumer Communications and Networking Conference, 2004. CCNC 2004. First IEEE. 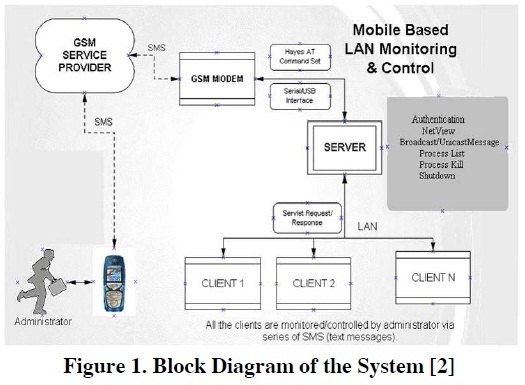 Amol Poman et al, “GSM Based LAN Monitoring System”, (IJCSIT) International Journal of Computer Science and Information Technologies, Vol. 3 (3) , 2012. E. Wong, “A Phone-Based Remote Controller For Home And Office Automation”, IEEE Trans.Consumer Electron., vol. 40, no.1, pp. 28- 33, February 1999. Nitin D. Shelokar and Dr. S.A.Ladhake, “Network Handle by mobile” in International Journal of Computer Trends and Technology, May to June Issue 2011.